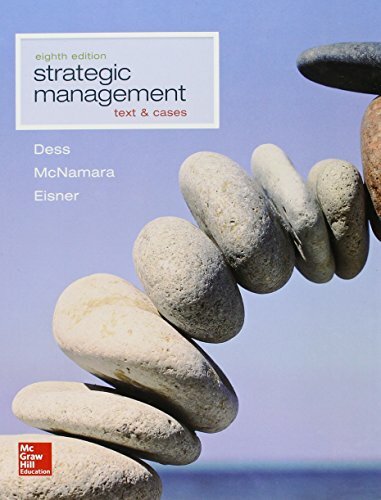 1259278212 –Strategic Management: Text and Cases, Eighth Edition, written by the highly respected author team of Dess, McNamara, and Eisner, continues to provide readers what they have come to expect of this title: solid treatment of traditional strategic management topics, application of strategic management concepts to real-world examples, and interwoven contemporary themes revolving around globalization, technology, ethics, environmental sustainability and entrepreneurship. The eighth edition’s case package has been thoroughly revised to maximize freshness and engagement. It continues to emphasize relevancy and currency and to offer up-to-date financial data and videos to match each case. All cases focus on companies familiar to students. In this edition, five are new (Campbell Soup, General Motors, Avon, Tata Starbucks, and Greenwood Resources) and twenty-six have been thoroughly revised (Apple, eBay, JetBlue, Johnson & Johnson, and Zynga to name just a few of the familiar favorites). The case package continues to offer both full-length and short-form cases, giving instructors and students unparalleled quality and variety.